Last week, one of the big stories in Nashville’s music scene became the potential bulldozing of Music Row’s historic Studio ‘A’, currently under the care of musician Ben Folds who’s been renting and upkeeping the space for the last dozen years. Studio ‘A’ has been in service since 1964, and was the site of some of country and pop music’s most important recordings, so when Ben got word that the studio was being sold to Bravo Development, the piano player feared the worst, and wrote an impassioned open letter to let people know the important landmark might be in trouble. A rally was planned for Studio ‘A’ on Monday morning (6-30, which still transpired to raise awareness about preservation in general), but the developer let it be known on Friday that it was always the plan to keep Studio ‘A’ in tact as part of any development plans. Crisis averted, right? It was for Studio ‘A’, but it wasn’t for the Musicians Hall of Fame a few years ago. Another controversial development plan that would have put a Walgreen’s on Nashville’s historic Lower Broadway entertainment district was also shot down last week. But these might just be symbolic wins in a battle Nashville is waging that may see the erosion not just of some of its historic places and buildings, but its creative epicenters which have transformed Music City not just into the mecca for mainstream country, but has given rise to some of the most sought after dirt for artists looking to be on the cutting edge of music innovation and creativity championed by an independent spirit. To say that Nashville is going through boom times doesn’t being to explain the half of it. Nashville has always been a draw to people with dreams of becoming big country music stars, many that end up feeding the city’s labor force for service staff at restaurants or other low skill jobs as they struggle to get a seat in exclusive songwriter circles or acoustic rooms that may help them land their big break. Some people will tell you the city’s music business is simply set up to subjugate people’s dreams, and that popular country music is just a promotional tool for the system, with millions of dollars of promotion, management, and studio time being spent by people who ultimately will never have a chance at the big time. But with the currently popularity of country music, and the massive promotional boost ABC’s hour-long drama Nashville has given to the city, there’s parts of town that feel like they are about to burst apart at the seams, and many such neighborhoods are the places that young, aspiring artists set up shop to incorporate themselves in the creative channels running through the city. Nashville isn’t just the home of Taylor Swift and Tim McGraw, it is the home of Jack White and Dan Auerbach. It is the home of Caitlin Rose and Sturgill Simpson, of Jason Isbell and Cory Branan. It is also the home of scores of songwriters and performers that ultimately contribute to the music world creatively, even if their names are not well-known to listeners. They offer up co-writes, they influence the bigger artists that can’t take the same risks the smaller ones can. The concentration of cutting-edge talent in one place creates and environment of healthy competition that spurns everyone on to the benefit of listener’s ears, and that is what Nashville has become in the last half decade in the shadow of downtown’s big buildings, and beyond the business-oriented mindset of Music Row. If you look at many of American popular music’s big movements and eras, they started in areas where low rents fostered the creative process. Black slums gave rise to American jazz and blues music. An abundant supply of big Victorian houses in San Francisco’s Haight Ashbury neighborhood allowed entire bands to move in together and have plenty of practice space right beside other bands with who they could knock ideas around with, collaborate, and coordinate tours and network with. The urban blight of Compton gave rise to Gangsta rap, Seattle to grunge, Laurel Canyon to the sound of the 60’s, Austin to the Outlaw movement, and when WSM’s Grand Ole Opry became one of the biggest radio shows in the nation, by centralizing much of country music’s talent in one place, it allowed an entire new genre of American music to form. “This is where my grandfather’s house used to be” native Nashville resident Justin Townes Earle tweeted out last year. Nashville’s creative working poor are getting priced out of the city, and this could spell an ebbing of Nashville’s creative influx. The Nashville Ledger recently ran a story about this very problem, written by Jeannie Naujeck. One of the reasons East Nashville has become a haven for the creative poor is because of its affordability compared to the United States’ other entertainment centers like New York and Los Angeles. Ironically, the influence of New York and LA on the business side of Nashville’s music scene has always been given credit for why country music artists are offered less freedom by labels. Since many major labels only run satellite offices on Music Row while the big shots remain in bigger cities, it necessitates tighter controls. This is one of the reasons country music’s “Outlaw” movement of the mid 70’s was partially centered around Austin, TX. But even before East Nashville was experiencing pricing pressure on musicians moving and remaining in the neighborhood, many were already flocking from East Austin, where the same wave of gentrification and urban renewal has been sweeping independent artists out of the city like a street sweeper. Home prices in east Austin have tripled since 2007 by some estimates, creating a steady flow of musicians from Austin to Nashville over the last few years. Nashville also seemed more inviting because unlike Austin, there was more label and business infrastructure comparatively. Now when looking at home prices and rents, it’s six one, half-dozen the other comparing the two music-oriented cities, while condominium and other residential developments encroach on both of the city’s entertainment corridors, causing neighborhood conflicts with live music venues. Same can be said for Echo Park in LA, and other creative places in the United States that are being brought under price pressure, many times by retiring baby boomers moving into condos built in creative areas, or young affluent hipsters who don’t yet have to worry about quality of of schooling, so they can justify moving into traditionally downtrodden neighborhoods. The next question would be, where do the musicians go? Many times they’re scattered to the four winds, living in outlying, and more affordable areas, and commuting into the city when they can. And while some artists and musicians will inevitably land on their feet, and if they’re good and industrious enough, find their appropriate path to a sustainable music career, with the lack of proximity to other creative peoples, the type of energetic and competitive environment can’t thrive like it did before. Inevitably, necessity becomes the mother of invention, and other creative epicenters crop up: Portland, OR, Athens, GA., etc. But as locales far removed from the footsteps of the industry become the new creative epicenters, artists will no longer have that ability to help influence and foster a creative environment that helps push all of music creatively, and collectively. On a sidenote I think your aware we lost an independent DJ/production person last week in Nashville with the passing of Ray Parton. He moved to Nashville about 2012 after stints as a DJ in Ga and Tx. Music City and Austin must work harder to bring back the music. I like Janice’s sentiment”¦but I also know as you do, Trigger ”¦ the landscape has changed dramatically and possibly irrecoverably. The driving force of all music these days is youth. At one time, that wasn’t as true in Country Music. But the movement to digital has pushed the needle. The artistry will become more and more watered down, and as such, someone who makes any small stride will be seen as “revolutionary”. And THAT is when the music will come back. The pendulum always has to swing”¦ and it will continue to swing in the direction of banal, pedestrian lyrics that do nothing more than progress the song from rhythmic moment to rhythmic moment until radio is completely over-saturated with that. And then, some artist will make a stripped-down version of a song that is sparsely produced, and actually has a lot to say – and it wins awards and makes that artist a ton of money, and then people will start producing that music again. Kacey Musgraves , in my estimation , may be the kind of artist you’re talking about . Yes there are countless others….but she’s , at least , made a dent on an admirable scale just when the music needs it most . Young fans who only know the Cruise Kids , Luke Bryan and Taylor Swift have , at least ,now been exposed to a better product with Musgraves getting airplay and recognition by the industry. I’d throw Brandy Clark and Miranda Lambert into that mix …most of PLATINUM is lyrically stellar compared to the generic overdone options. Once again, I partially blame the lack of a strong middle-class for this type of whiplash transformation from blight to unaffordability. The one area of doubt that I have with this article is about the cost of living in San Francisco or Laurel Canyon in the 60s. Given the former’s massive population density (and lack of blight compared to Northeastern or Midwestern cities) and the latter’s proximity to Hollywood and Beverly Hills, I am not sure whether the rent there was ever as low as in Austin or Nashville now (in inflation-adjusted terms, of course). Laurel Canyon is a little more of a complicated situation. It was probably not lower class, but being out-of-the-way at that time also did not make it cost prohibitive. However the most important point about Laurel Canyon is it fostered the creative process, with Crosby, Still, Nash, Young, Frank Zappa, Jim Morrison, and on and on calling the location home. I see. It’s funny because driving through the Haight-Ashbury nowadays, it does not look remotely blighted, although it is obvious that beneath the veneer of renovation the housing stock is rather old. Haight, and SF in general, has had 50 years of gentrification, so you would not expect to see the past. Detroit is an interesting exception, I think. An artistic center since the 60s, but also hit heavily by the decimation of manufacturing and the auto industry in particular. Also, I may be wrong, but I think control of R&B sound was more local, less controlled by NY or LA. In any case, Detroit has a a long way to go before gentrification. And that is the tension, of course, a bit of gentrification is welcome is a city like Detroit, where there are thousands of abandoned buildings and no tax base. Urban planners recognize the pattern, and have made various attempts to build maintain more economically diverse neighborhoods, but gentrification is hard to control once it starts. And hey, whatever happened to Alphabet City? Murfreesboro should be the new East Nashville.. Yes, and Middle Tennessee State University has also become The University of the State of Tennessee. The school in Knoxville has become little more than a sports franchise with an academic appendage attached to it. If you’ve watched Tennessee Football lately, you know that statement is bunk. Yeah, the Vols have been down for a few years, but Butch Jones has been doing some solid recruiting. We’ll see what happens. To provide one example, one thing Portlanders have long expressed immense pride in is the food-cart culture here (namely mobile kitchens out of which food is served to people from the pedestrian traffic, but of which most occupy sidewalks, parking lots or vacant places and invite commuters, employees and all others to sit on cafe stools or communal tables and enjoy great food at a bargain. What makes them especially appealing are two things: 1) their quirky and innovative design and 2) the fact that you have such a direct and intimate connection with the chefs and others who frequent the food cart commons that can’t be replicated in a bustling restaurant setting. They boost social capital, improve walkability, and help make creative use of spaces that would otherwise be vacant and aesthetically displeasing. And, finally, studies here have shown that this creative model allows us to “think creatively about our local economies and the role we want our city streets to play.” Many food carts have since evolved to become thriving brick-and-mortar cafes and restaurants……..and have persuaded business developers that their model is viable. Same type thing is happening in the Seattle-Tacoma area. 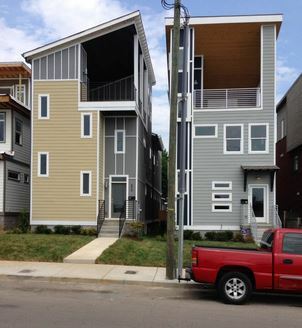 The bizarre narrow apartment/townhouses like in that picture are being jammed into tiny lots in the Ballard/Fremont neighborhoods in Seattle and then to put a cherry on top they restrict street parking for bike lanes and the like as they increase density. Tacoma has an entire area with nothing but these things that have been built. So sadly this is a nationwide trend that is leading major cities to become nothing but upper income/lower income with the middle moving to the suburbs. Ah the Seattle area…there’s one place that I can actually talk about from personal experience, since I grew up there. I left in 2007, but I still visit often. One important aspect that distinguishes the Seattle area from metropolitan areas in California or the Northeast is the presence of a still strong middle class. Nonetheless, there is an important divide between the working middle class and the professional upper middle class. Broadly speaking, the suburbs north and south of Seattle (Snohomish County, Pierce County, and the Green River corridor in King County) are dominated by working class residents, with the economy centered on Boeing. On the other hand, the Eastside suburbs (Mercer Island/Bellevue/Kirkland/Redmond/Sammamish, as well as new development in exurbs such as Duvall, Carnation, and North Bend) are dominated by the upper middle class, with the economy centered on Microsoft and other high-tech and software companies. Seattle itself is divided between the creative-class-heavy north (the University of Washington area) and the industrial and blue-collar-dominated south (where the Boeing headquarters used to be located before it moved to Chicago). In recent years, Capitol Hill has been the focus of gentrification by artist types. Over the last decade or so, Downtown Seattle and the Eastside have seen remarkable levels of yuppie gentrification driven by Microsoft. The number of condos built along Elliott Bay has been simply staggering and has changed the landscape of Downtown Seattle completely. Similarly, the high-rise stock in Downtown Bellevue has probably doubled since the 1990s, with probably most of the increase attributable to the proliferation of Microsoft buildings. Bellevue Square Mall has become jazzy in a way that it wasn’t before, with most of its growth coming from upscale restaurants and shops. The greatest changes in city appearance, though, have taken place in Downtown Redmond. Looking at Redmond’s location, this would seem to be strange, since Redmond is far from the metropolitan center, Seattle. However, it makes sense considering that it is the city where Microsoft is headquartered. The pace of the change in Redmond has really surprised me. Even when I moved out of the Seattle area in 2007, the downtown area was still dominated by small shops, most of them featuring an Old Western theme. Over just the last 7 years, most of those shops have been torn down and replaced with one upscale condo after another. Looking back now, the construction of the yuppie Redmond Town Center way back in 1997 probably marked the beginning of a slow gentrification process that accelerated dramatically a decade later. All of this is threatening the affordable, middle-class, egalitarian character of the Seattle area. Combined with all of the pressure the Boeing management is putting on their employees’ wages and benefits, I am worried about the future of the Seattle-area working-class. I watched your video. Georgia Satellites is not real country music. Eric said it best with his summary of the gentrification cycle. 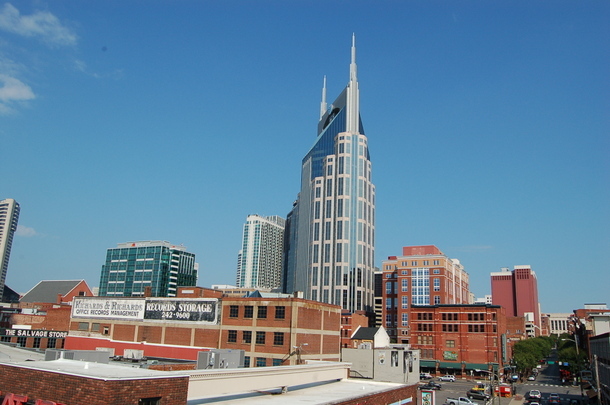 I pass through Nashville, frequently around it on I-155, and it is my impression that the main economic surge that I see is high-rise appartment buildings. I assume that their purpose is to accomodate the yuppies who inhabit the sweatshops located in the various glass tower office buildings 20 hours per day. Lower Broadway will become like Gatlinburg or Pigeon Forge in East Tn as the power brokers and business community types try to monetize its cache as a hub of country music over the course of the last many, many decades. Instead of seeing bars with aspiring singers, we will se Hard Rock Cafes, etc. There may already be one there, I don’t know because the only time I go there is to go to the Ernest Tubb Record Store (where I leave a considerable amount of money). I don’t know as much about East Nashville, but it sounds like it is becoming too pricey for the folks who make the trains run on time with the rest of the city and with the country music industry. I veiw Grimey’s Music Store on 8th Street, and not Lower Broadway or Music Row, as the epicenter of independent music in Nashville. Kyle, have to take you up on one thing, you can’t really compare East Nashville and East Austin. East Austin went straight from barrio/ghetto to gentrification without ever being a Bohemian enclave. Very few musicians ever lived east of the freeway and the few venues there were exclusively Hispanic or African-American. For the most part, Austin musicians (and music writers come to that!) got pushed further and further south. Still, sorry to hear about East Nashville.